A mixed bag in today’s Sunday Shorts – we mourn the passing of two public figures, and note their presidential ties. And we (gently) take issue with a recent column by Peter Orszag who waded publicly into the political polarization debate. Let me begin with the passing of the great presidential scholar James MacGregor Burns who taught for so many years at Williams College, one of our fellow NESCAC institutions. The New York Times obituary does a decent job (as much as any obituary can) capturing the important details of Burns’ life professional life. My students will be familiar with him through two excerpts, one dealing with FDR’s nomination in 1932 and the second about FDR’s ill-fated 1937 court-packing scheme, that I assign from the first volume of Burn’s wonderful study of Roosevelt, The Lion and the Fox. Others will know him for his pioneering study of leadership, particular his juxtaposition of transactional vs. transformational modes of leading. But in 1964 Burns published another important book titled The Deadlock of Democracy: Four Party Politics in America, in which he argued that the American political system was stymied by the lack of unified political parties and weak presidential leadership. Because each party was internally divided, Congress lacked a working majority which prevented action on important national problems. Burns proposed a number of potential solutions, such as coterminous four-year terms for the President and members of the House. But the basic thrust of his argument is that to break the deadlock, we need strong, internally unified parties controlling both branches of government. Alas, Burns’ dream has come true in part – at least the strong party portion – but against the recurring backdrop of divided government. It is a reminder to be careful what we wish for. I never met Burns. But when I contemplated jumping from a major research university to a smaller liberal arts college, I looked around to see whether there were any presidential scholars still publishing regularly in a small college environment. Happily, Burns came immediately to mind. When I found out that he never left Williams during blueberry picking season, I knew I had found a kindred spirit. May you rest in peace, Professor Burns. In the same week that Burns died, Peter Orszag, the former director of the Congressional Budget Office and later Obama’s first OMB director, published this Bloomberg column arguing that part of the blame for the political division in our nation’s Capitol lies with us, the voters. I don’t have the time (nor space) in the Sunday shorts section to give Orszag’s argument its due, but I do want to take time to clarify two potentially misleading points he makes. First, as evidence of growing polarization, he cites (as does everyone!) the recent Pew survey finding that partisans’ views of the opposing party are growing increasingly negative. But, of course, that finding is consistent with party sorting, rather than ideological polarization. If the opposing party is increasingly dominated by a more ideologically uniform view, it makes sense that it will be viewed with more suspicion by those in the opposing party – even if there has been no real aggregate increase in ideological polarization. It is just that the Democratic party has become more uniformly liberal, and the Republican’s more uniformly conservative – the definition of party sorting. If I lean slightly liberal, I would grow increasingly skeptical of a Republican party that has shed its more liberal members. But as I’ve noted before, there’s been no overall increase in the number of liberals (or Democrats) or conservatives (or Republicans) in the last two decades. Second, Orszag takes Morris Fiorina to task for suggesting that “politicians are disconnected from the people.” In fact, Orszag argues, the evidence is that increasingly Republican representatives are catering to the needs of Republican voters in their district, and Democrats are responding likewise to their Democratic constituents. Rather than a disconnect, then, as Fiorina argues in his book by that name, Orszag believes the link between elected officials and partisans is growing stronger. But this is a misreading of Fiorina’s argument. What Orszag describes is in fact entirely consistent with Fiorina’s description of party sorting – as parties become more ideologically homogenous, it stands to reason that you nominate and elect more liberal Democrats and conservative Republicans. Instead, the real “disconnect” Fiorina writes about is between what elected officials produce acting collectively – say, legislation coming from Congress or, more accurately, NOT coming (cue Burns!) – and what the general public wants. But don’t take my word for it – here’s what Fiorina wrote in Disconnect: “As the parties have become more internally homogenous and more distinct from each other (Democrats more liberal, Republicans more conservative), it is probable that dyadic or microrepresentation – the correspondence between the positions and actions of an elected official and the legal jurisdiction that elects him or her – has become easier and more accurate, whereas collective or macrorepresentation – the correspondence between what representative institutions produce and the entire public wants – has deteriorated.” In short, the evidence Orszag cites exactly supports Fiorina’s argument about a strengthening of partisan-oriented dyadic representation at the microlevel. The real disconnect that worries Fiorina is between what those officials do collectively in Congress and what the general public wants. Nothing Orszag cites contradicts Fiorina’s main point. Thirty five years ago this evening, President Jimmy Carter went on nationwide television to give his infamous “malaise” speech. You can watch the speech in its entirety here. If you listen carefully, you’ll notice that he never actually uses the word “malaise”. Instead, he talks about the “crisis of confidence” that threatened the nation’s “will” and “unity”. It is an emotionally searing speech, noteworthy for the candor and level of introspection Carter displayed to a national audience that has rarely, if ever, been expressed by any elected official again. Unfortunately, through the years, the “malaise” speech has come to symbolize all that went wrong with the Carter presidency. As a result, pundits – and presidents too – have tended to draw the wrong lesson from this event. Some context is useful in understanding why Carter gave the speech. Three years into his presidency Carter’s approval ratings had dropped below 30% and were at the low point of his presidency to date. While he was preoccupied with two important overseas trips – one to sign the SALT II treaty with the Soviet Union and then a diplomatic visit to Japan and South Korea – Americans back home were waiting in long gas lines as they suffered through another energy crisis triggered in part by the Iranian revolution that overthrew the American-backed Shah. Initially Carter planned on giving still another speech urging Congress to address the energy crisis, but ultimately he decided that it would be waste of his time, since he had already given several talks on this topic. Instead, he retreated to Camp David, and summoned leading public figures, including many prominent religious leaders, to meet with him to discuss the state of the nation. Then, like Moses coming down the mountain, Carter went on television to give his famous address, one that went well beyond discussing the energy crisis, although he discussed that too. But most of the speech showcased Carter, the former Baptist preacher, as the nation’s “minister-in-chief”, beginning with his self-flagellation as he recounted criticism of his leadership, and then addressing what he believed to be a growing loss of confidence in the nation’s leaders and institutions. The long-term impact of the speech, however, may have been more significant. Like the ebullient FDR running against the dour Hoover during the depths of the recession in 1932, Ronald Reagan, with his sunny optimism, was immensely successful during the 1980 campaign at portraying Carter as the nation’s “scolder-in-chief” who was too willing to blame Americans rather than his own inept leadership for the nation’s ills. Although polling suggested that many Americans’ views on the issues were closer to Carter’s than to Reagan’s, it did not prevent Reagan from winning the election. When Reagan won reelection in a landslide four years later by campaigning on the “It’s morning again in America” theme, the die was cast. But it wasn’t just Reagan who capitalized on Carter’s failed attempt to level with the public – Ted Kennedy later noted that the speech convinced him to challenge the incumbent president for the Democratic nomination. Mindful of the purported lesson of Carter’s “malaise” speech, no national candidate would ever again make the mistake of speaking so candidly, and in such critical tones, about the American people even if much of that criticism was self-directed and perhaps even true. Instead, candidates on the hustings are much more likely to take a page from the Reagan playbook by emphasizing the indomitable American spirit, can-do work ethic, etc. And woe to any candidate who slips up and leaves himself open to the charge that Americans might be at fault for anything, as in this Romney reaction to an Obama statement. That is the lasting legacy of the “malaise” speech. Meanwhile, Carter went on to have a much more successful post-presidency – indeed, he has arguably been one of the most effective ex-presidents in history due to his philanthropic efforts through the aegis of the Carter Center. He has never expressed any regret to my knowledge regarding the “malaise” speech – indeed, the only regret I have ever heard from him regarding his presidency was his failure to include one more helicopter in the ill-fated Iran rescue mission. But that is a topic for another day. For now, let’s remember when it was morning, again, in America. On this day in 1985, a 74-year old Ronald Reagan underwent surgery to remove a benign polyp from his intestine. While under the knife doctors discovered a cancerous polyp which necessitated a second surgery to remove a portion of his intestine. The event would be of little historical interest (Reagan made a full recovery) were it not for the fact that this also marks the period during which Reagan first approved what became the Iran-contra affair – the ill-fated effort to trade American arms to Iran in return for their help in securing the release of Americans held hostage by Mideast terrorist groups. In his July 17th diary entry, Reagan writes, “Some strange soundings are coming from some Iranians. Bud M. [Robert McFarlane, Reagan’s National Security adviser who initiated the plan to trade arms for hostages] will be here to talk about it. It could be a breakthrough on getting our seven kidnaps victims back. Evidently the Iranian economy is disintegrating fast under the strain of war” [excerpt reprinted in Lou Cannon’s Role of a Lifetime]. McFarlane met with Reagan in the hospital the next day, with only Chief of Staff Don Regan present, and informed the President that it might be possible to open up a communication channel, using Israeli officials as intermediaries, with members of the Iranian government. McFarlane’s goal in initiating contact was largely strategic; he sought to better position the U.S. to address the power vacuum likely to occur in the aftermath of the death of the Iranian leader Ayatollah Khomeini. However, it is clear that Reagan’s primary motive in agreeing to McFarlane’s plan was to secure the release of the hostages, which included the Mideast CIA station chief William Buckley. Reagan had just come off a meeting with one of the hostage’s families and was visibly moved by their appeals to him to do something. However, there is no evidence that either McFarlane or Regan made it clear to Reagan that by subsequently approving the sale of arms to Iran in order to secure the hostages’ release, Reagan was in effect negotiating with kidnappers, thus violating administration policy. Indeed, there is some question whether Reagan, who was recovering from major surgery, was in the best frame of mind to consider such a momentous decision. When pressed later by members of the Tower Commission to recall when he actually approved sending arms to the Iranians, Reagan gave conflicting accounts and it became clear that he simply didn’t remember when, or even if, he gave the initial approval. It is a reminder that although we quite rightly hold presidents solely accountable for the decisions they make, those decision are based in part on the information, expertise and advice of their advisers. In this case Reagan’s advisers failed the President, with significant consequences. Hope you had a great Sunday! As I wade into drafting the final version of my manuscript documenting the growth of the White House staff, I’ve been working my way through years of archival material I’ve accumulated from visits to 11 presidential libraries (not to mention material from scores of interviews with former White House aides). I thought it might be interesting to periodically present some of the historical documents as I come across them – I’ll try to do this every Saturday. This first installment is from the start of Ronald Reagan’s second term as president. As part of the transition, Regan commissioned a number of studies regarding the various functions of the White House offices, including one from the Scheduling Office, which operated under the supervision of Michael Deaver. Deaver was part of a triumvirate of senior aides, along with Baker and Ed Meese, who served as Reagan’s primary first term advisers at the top of the White House organization. When Regan became chief of staff at the start of the second term, he essentially took on all of their jobs. Deaver’s primary responsibility was orchestrating the public face of the Reagan presidency, which included overseeing communications, scheduling and travel. 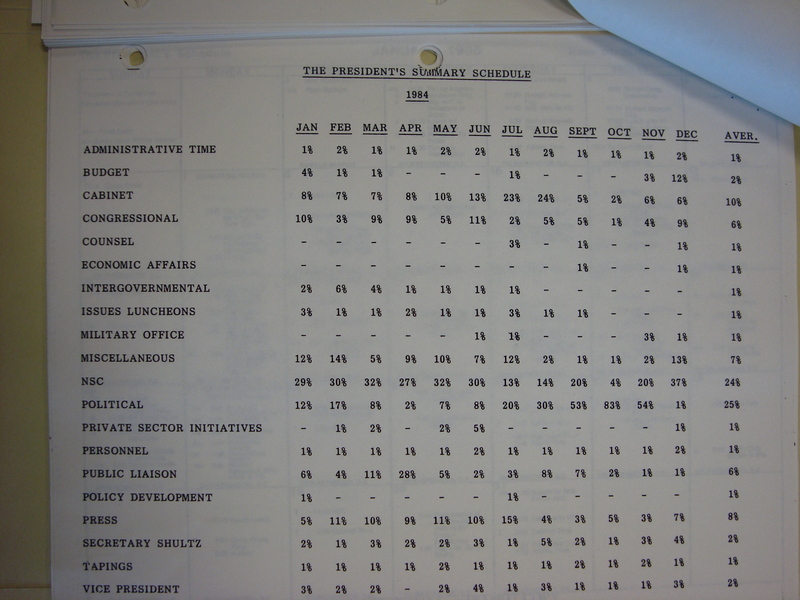 Among the many documents Deaver passed along to Regan was this one, which offered a monthly breakdown of Reagan’s schedule, organized by subject matter, for 1984. Note that the summary does not include time spent in his daily staff meetings with his senior aides. Nor does Deaver (or the aide who created it) specify how the table was constructed. Not surprisingly, considering this was a period of escalating tension with the Soviet Union, Reagan spends about 25% of his time dealing with his NSC advisers. Much of that time occurs early in the year, as Reagan struggles to extricate the U.S. from its peacekeeping mission in Lebanon after the tragic terrorist bombing of the Marine barracks there that killed 241 American servicemen. By the fall, however, Reagan is in full-bore campaign mode, with over 50% of his scheduled time dealing with politics in September, and more than 80% in October. (The Republican Convention that renominated Reagan took place in late August that year.) All told the time Reagan spends in political meetings for the full year equals his time spent on national security issues and together they account for about half his scheduled time. Everything else pales in significance; the third biggest chunk of time is with his cabinet (8%) and the press (8%). This is just one year from the Reagan presidency, and it is an election year to boot, so I wouldn’t want to generalize too much from Deaver’s chart to other presidencies. But my sense is that the preoccupation with national security issues is not unusual for the modern presidency, in large part because there is no other office that can take the lead in this area. Certainly Congress has proved itself ill-suited to exercise a leadership role in the national security realm. As it turned out, however, Reagan was about to embark on perhaps his most significant foreign policy initiative – the ill-fated effort to trade arms for hostages that ultimately cost Regan his job, and almost cost Reagan his presidency. Howard Baker, the three-term Republican Senator from Tennessee, died last week at age 88. He was remembered, and deservedly so, as “the great conciliator” who in his eight years as the Republican Senate leader (including four as majority leader) forged a reputation as a moderate (despite a rather conservative voting record) who was able to work both sides of the political aisle. But perhaps his most important service to the nation took place after he left the Senate. In early 1987, the Reagan administration was in full damage control as it struggled to deal with political fallout from the Iran-contra affair. As most of you know, despite a public policy of never negotiating with terrorists, Reagan had in fact secretly authorized the trading of arms to Iranian “moderates” in return for their help in negotiating the release of Americans held hostage by various Mideast terrorist factions. Moreover, overpayments from those sales had, evidently without Reagan’s knowledge, been used to support the Nicaraguan contras in their struggle against the Soviet-backed Sandinista government despite a congressional ban on U.S. aid to these “freedom fighters”. Somewhat belatedly, and only after prodding from his wife Nancy, Reagan agreed to replace his chief of staff Don Regan, under whose watch the Iran-contra affair occurred, with Baker who, at the time, was widely perceived to be a front-runner for the 1988 Republican presidential nomination. It took a personal plea from Reagan to convince the reluctant Baker to take the job in the national interest. But as Jane Mayer and Doyle McManus recount in their excellent book Landslide, Baker did so while keenly aware of a whispering campaign that Reagan had begun to show signs of mental deterioration. It was only after directly observing Reagan handling a variety of presidential responsibilities that Baker concluded the rumors were untrue. He went on to orchestrate the resurrection of Reagan’s presidency, even at the expense of his own presidential aspirations. In Reagan biographer Lou Cannon’s words, “More than any single person, it was Howard Baker who brought Reagan back.” That may have been his greatest service to the country. Jill Abramson, the deposed New York Times executive editor, has landed on her feet with a lecturer position in the English department at Harvard University. I had hoped to do a separate post on the circumstance surrounding her firing, but more important events took precedent. As you will recall, Abramson was let go amid conflicting reports regarding whether, and to what degree, gender played a role in her firings. In the media hullabaloo that followed, I thought one important point was underplayed: whether or not gender mattered in Abramson’s firing, the fact that it became an issue in the ensuing discussion suggests we have a way to go before there is true work-place parity. The reality is that women are fired from high-profile management positions all the time. Until those decisions are discussed solely on the basis of the woman’s own (in)competence, it’s hard to argue that we have true gender equality. Finally, Stanford political scientist Morris Fiorina tries once again to set the record straight regarding what the Pew Report report really says regarding whether Americans are becoming increasingly polarized. This relatively short interview (listen here) is worth a listen – pay particular attention to what happens when you ask a moderate public to choose between two relatively polarized options. Note also that increasing ideological consistency is not evidence of increasing polarization. The bottom line? There is no evidence of increasing ideological polarization in the public at large in the last three decades – contrary to what many pundits have said based on the Pew survey.